Arex's Rex Zero 1 pistol complies with strict military standards for reliability. Its frame is constructed of T7075 aluminum with steel locking block inserts and a hard coat anodized finish. The nitrocarburized slide and cold hammer forged barrel are made from solid steel. YouTube reviews are on point for this gun. Has everything I want in a P226 clone. From my perspective, this is a great value! Great gun for the money and has features SIG 226 does not. 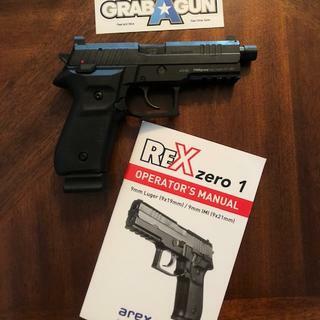 I purchased the Rex Zero 1 to add a tactical handgun to my arsenal. The firearm is reliable and runs whatever I feed it without a single jam so far with moderate recoil and responsive trigger. I added a Trijicon RMR and upgraded the grips with Houge G10s. The frame is all cast metal and feels good in the hand. I plan to install a DPM triple spring recoil kit when they come out with one for the tactical model. Overall I am happy with my purchase. This is a workhorse, not a competition firearm. The Rex Zero 1 has high profile white dot sights, ambidextrous safety, loaded chamber indicator, full length slide rails, and a large trigger guard for the use of gloves. Tactical models feature a threaded barrel with 1/2"x28 threads and include the ROR (Rex Optics Ready) system with four plates for optics attachment. This model has a black finish and 20-round magazine capacity. Watch this video to see the specs, features and benefits, options and reviews for both the Arex Rex Zero 1 and Rex Alpha lines of 9mm handguns.